CHARLOTTE, N.C. (AP) The Panthers are bringing the heat under first-year coordinator Steve Wilks – and it’s working. Carolina is 5-3 at the midway point of the season, due in large part to its blitzing defense. The Panthers rank No. 2 in the league in overall defense and have held half of the eight opposing offenses they’ve faced this season without a touchdown. They’re second in the league in sacks with 27. ”Steve’s personality is an aggressive style guy,” Panthers coach Ron Rivera said. The numbers attest to that. The Panthers are blitzing nearly 42.6 percent of the time this season on passing plays, which represents a dramatic 17.3 percent increase over last season under Sean McDermott, according to Pro Football Focus. McDermott left this past offseason to become the head coach of the Buffalo Bills. The only team in the NFL blitzing more than the Panthers is the winless Cleveland Browns (45 percent). Wilks agrees that he has an aggressive, attacking mentality, but said Carolina’s blitz scheme is based on matchups. ”At times it will be more aggressive based off what we see on tape and other times it may be more front coverage,” Wilks said. It helps, of course, the Panthers reacquired free agent defensive end Julius Peppers this offseason to go along with two of the game’s best linebackers in Luke Kuechly and Thomas Davis. In Kuechly and Peppers, the Panthers have two potential Hall of Fame players. The 37-year-old Peppers has responded with 7+ sacks in eight games, including two strip-sacks. But Wilks also likes to mix his blitzes up, sometimes sending Captain Munnerlyn after the quarterback on a corner blitz. Carolina’s defense has only allowed six points in the past two weeks. ”We’re playing good,” Kuechly said. ”Steve Wilks and all those guys are doing an excellent job of game-planning and putting us in position to be successful and utilizing what we do well. Peppers said the Panthers can still be better. 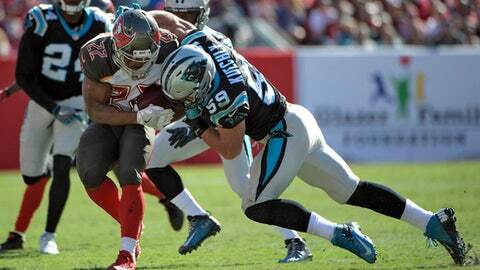 The Panthers limited the 49ers, Bills, Bears and Bucs offenses to three points each. However, they allowed 34 points to the Saints, 30 to the Patriots, 28 to the Eagles and 24 to the Lions. They’re a half-game behind the Saints in the NFC South entering a crucial division game this Sunday at home against the Falcons. One thing the Panthers haven’t done well on defense is create turnovers. Carolina had only four takeaways in its first seven games. But the Panthers are hoping the tide has turned after forcing a season-high three on Sunday in a 17-3 win over the Buccaneers.